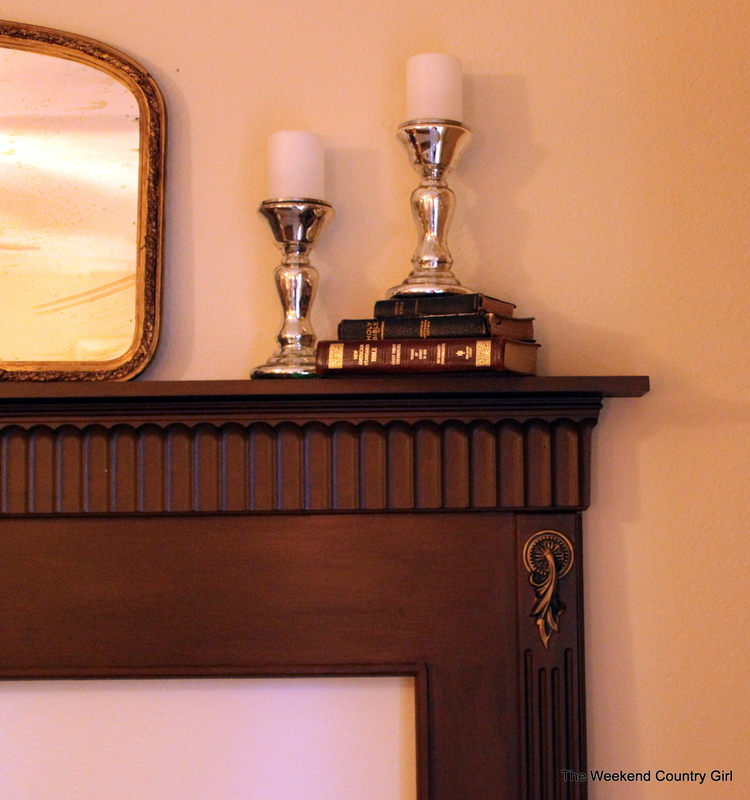 A young friend Elizabeth, and former student, of mine posted on Facebook a while back that she was looking for a mantle. She and a friend have moved into an apartment in Kemah, Texas. One of my favorite Texas cities. Elizabeth has a vintage, shabby, once grand now aged style. I started looking for a mantle for her on my expeditions but wow! Even at the ReStore the small not so great mantles were north of $250.00. I got a text from a friend asking if I wanted some furniture. The text picture looked like the furniture was wood so I jumped on it. A dresser with a mirror, night stand, and headboard. Hubby went to pick up the furniture and when it came home I realized it was not solid wood. It was particle board with a laminate over the tope that looked like wood. Even worse, the top of both the dresser and night stand had gotten wet and was swelling. 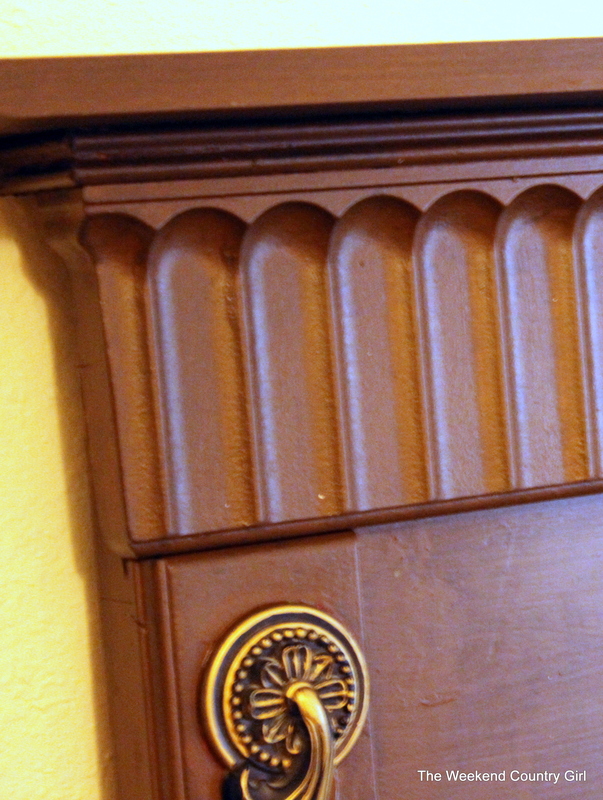 I knew it would not be a project for me, but I loved the detail on the headboard. I thought immediately that it looked like a mantle. This is one of those projects that as soon as I drew for Hubby what I wanted he ran with it. 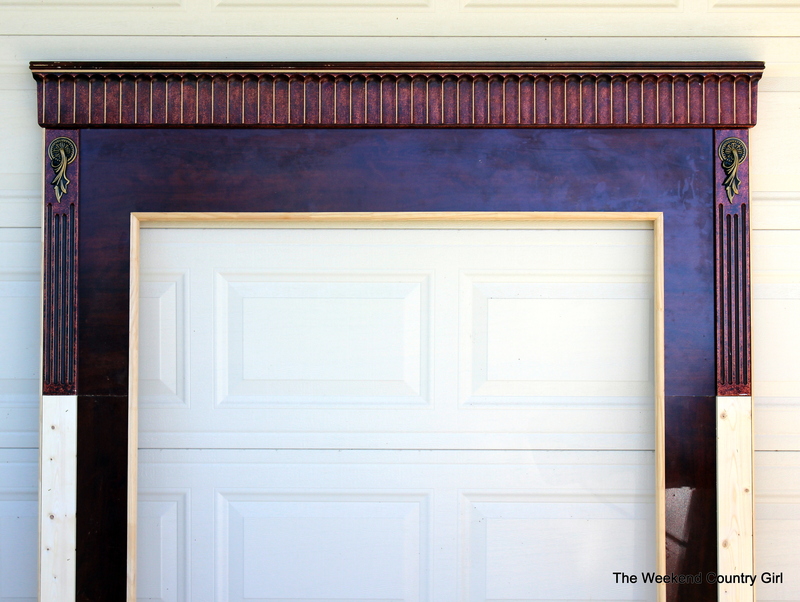 He bought some trim, used some from the hoard, and got it done in a matter of an afternoon. I did not get my part done, until today. Basically Hubby cut out a section from the headboard then divided what he cut out to use on either side to make the sides longer. 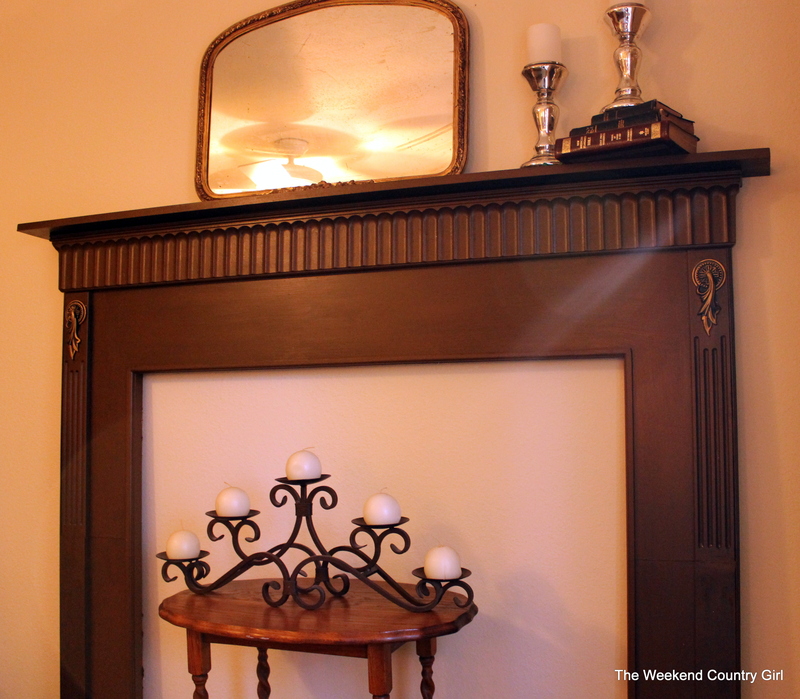 He purchased some cheap pine to make a wider mantle top and fill in where the trim ended. After a coat of Zinzer bonding primer and filling the holes with wood filler it was on to paint. 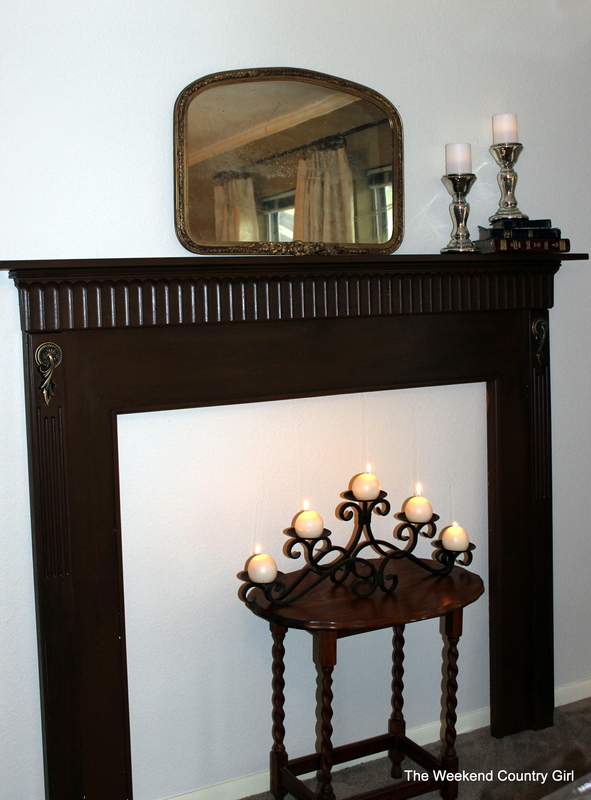 I love, love, love Behr Revival Mahogany. It is the perfect vintage color of brown. I panted it several times and in different directions so that it looked old and gave the impression that layers of paint were applied over the years. I glazed it all with a charcoal colored glaze so that hopefully it looks like something that is old and may have some soot on it. Today was one of those perfect painting days. The weather here was in the high 60’s low humidity and not much wind. I was able to whip it out in almost no time. The funny thing is a neighbor stopped by while I was painting. 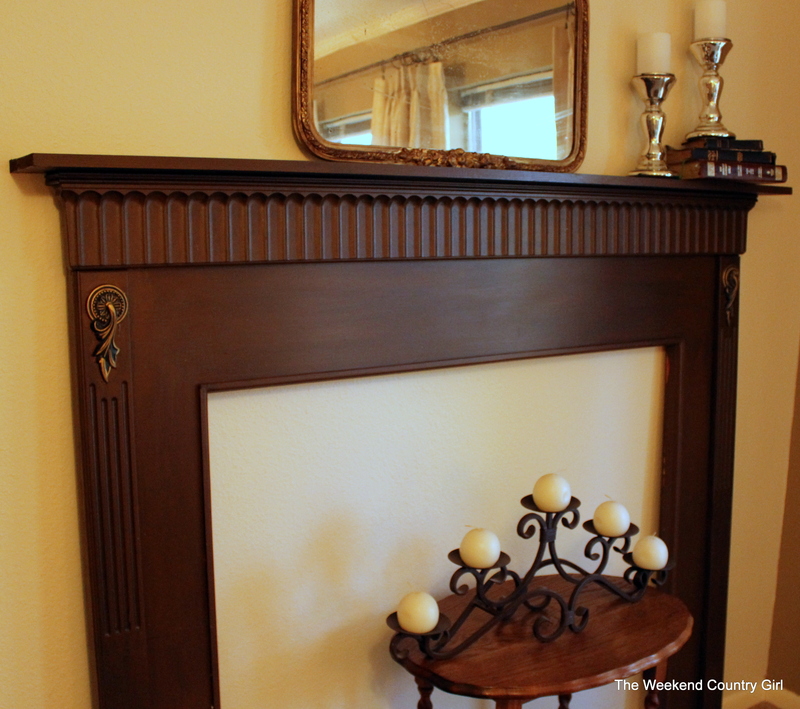 I hadn’t told her it had been a headboard when she said “I have been looking for something like that to go behind my bed.” I laughed and told her it was a headboard that I have turned into a mantle. 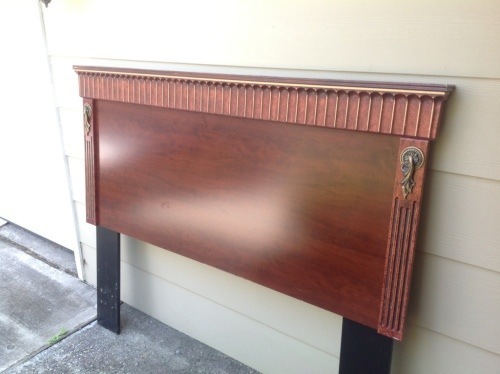 She said it should be a mantle turned into a headboard, turned into a REALLY COOL headboard. … How nice. What do you think about the results? I love it with my $2.00 plaster mirror. It is going to look great in Elizabeth’s home. That is so clever! Wow! Beautiful job! this is absolutely just, WOW! 🙂 Roeshel had it right when she said, clever…cause this just takes the cake! Beautiful and super cute idea! You’re invited to share it at SHOW-licious Craft Showcase….just follow the link! Hi there! Congratulations! You were featured at SHOW-licious Craft Showcase! Thank you, Marti. It was a fun and easy project that really turned out looking great. Thank you. I need to update this post with a picture of it in the apartment. It turned out really cute.